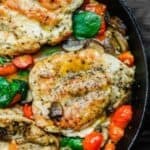 Italian-inspired skillet chicken. Simple chicken breast recipe cooked in white wine with tomatoes and mushrooms! Ready in 30 mins or less. Be sure to watch the video for how to make this Italian chicken below. Boneless, skinless chicken breasts are a staple item in most households. When prepared into thinner, 1/4-inch cutlets, they are even easier to cook. The ways you can dress up chicken breasts are endless. 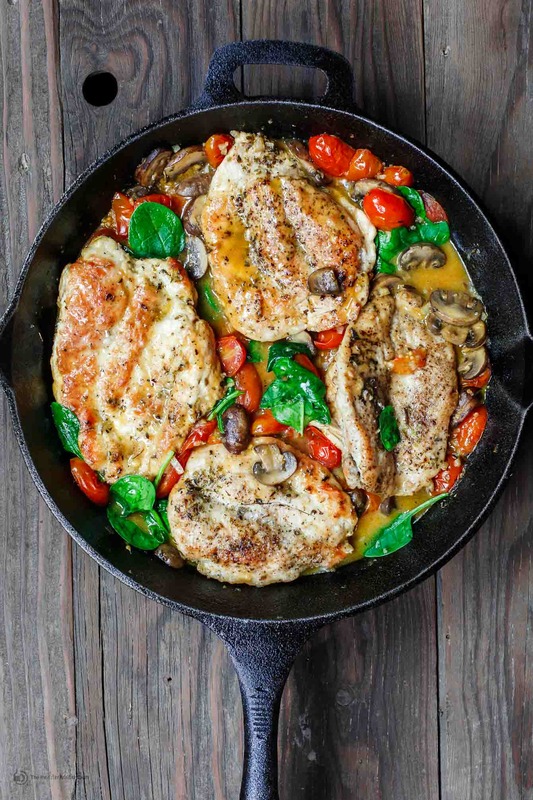 Today’s is a simple and bright Italian-style skillet chicken recipe with tomatoes and mushrooms. 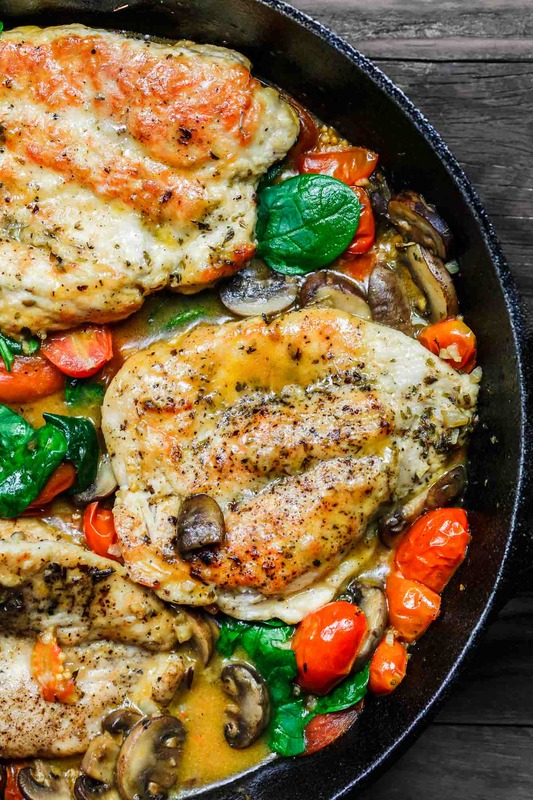 Why this Skillet Chicken Works? This is a very simple skillet chicken recipe that comes together in less than 30 minutes. You just can’t beat that! My main goal with this skillet chicken recipe was to keep the chicken cutlets from drying out. First, I browned the chicken quickly in a little olive oil. Then, to finish cooking, I added the chicken back into the skillet with a white wine-based sauce along with sauteed mushrooms, tomatoes, and garlic! I tossed a handful of fresh baby chicken at the end to finish the dish. What to serve along? 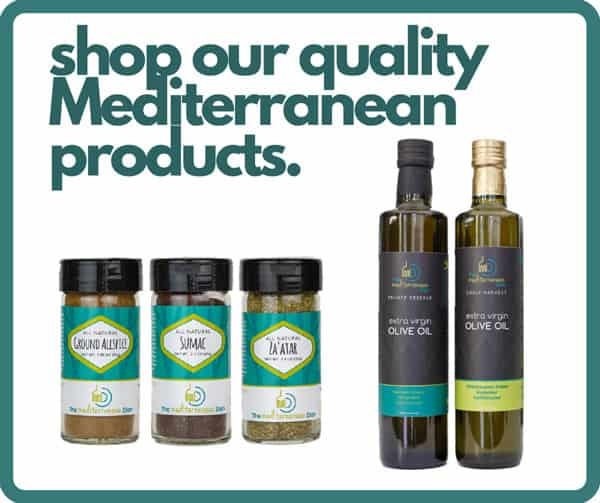 Serve it on your favorite small pasta like orzo or even pearl couscous. Hearty Italian bread is always a plus! 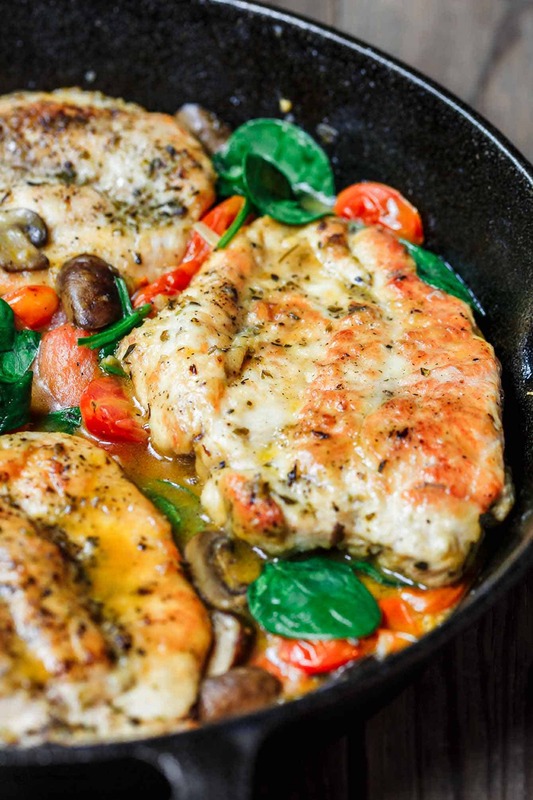 Easy, flavor-packed skillet chicken dinner w/ an Italian twist! Chicken cutlets cooked in a white wine sauce w/ garlic, tomatoes, mushrooms! 30 mins or less. Now add the white wine, cook briefly to reduce just a little; then add the lemon juice and chicken broth. If you like, stir in a handful of baby spinach just before serving. Enjoy hot with your favorite small pasta like orzo and a crusty Italian bread! I NEVER comment on recipes. I go through at least 5-10 internet recipes every month. This is hands-down the best. Everyone kicked their plate. I used frozen defrosted thighs instead and pounded them out first but didn’t change anything else. Thanks for such a great recipe that led to one of our best family dinners in quite some time. Bevin, this is so wonderful to hear! Thank you so much for taking the time to share with me. So honored! Love the flavors! Definitely company worthy! I made 2 minor modifications: I used boneless, skinless chicken thighs and Italian breadcrumbs to dip them in. Otherwise followed to a “T” and loved it! Great, Kathy! Thank you so much! Thank you! That’s great to hear!